This year De and I were fortunate enough to travel to New York for Thanksgiving break. It was a bucket list item of mine to see the Macy's Day parade in person, and it was wonderful! (Full gallery to follow after I finish reviewing and processing my 678 keeper images.). The two images that captured the feel of the event best to me were of course, first and foremost, all the enormous balloons, the trademark components of this parade. Some of them, like Snoopy, go way back to the beginnings of the event. Traditionally, the parade always ends with the arrival of Santa Claus, and with the huge "Believe" balloon behind him and Mrs. S., I found it very moving. 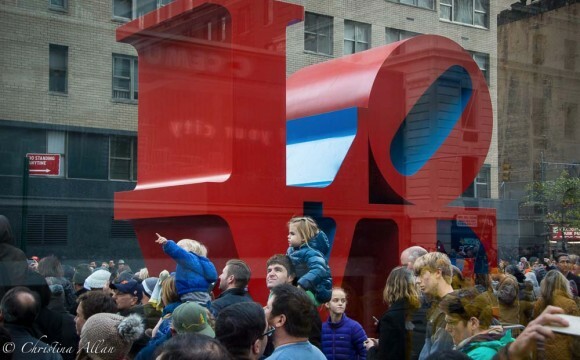 I also found it very moving to be mingling with all the New Yorkers on the street, and especially seeing the magical experience reflected in the children who were in the area. Dedicated fathers who had arisen in the wee hours to get a good spot on the parade route, hoisted their little ones on their shoulders throughout much of the event. I took this second shot through the bus stop behind us at some of these beautiful folks (I love the "No Standing" sign on the wall) with a backdrop of the red LOVE sculpture, and the backward reflection of "your city" captured a sense of all the good humor, fun and sheer love of this event and great city. I love New York, and wish everyone a wonderful holiday time, whether you celebrate Christmas or other holidays!